This book is a collection of 22 projects designed especially to get the most use out of your yarn without sacrificing beauty and style. 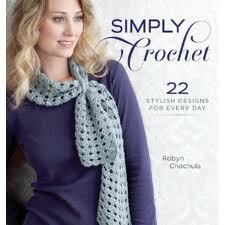 Designs are included from some of our favorite designers and each one includes the necessary symbol crochet charts. Projects use one, three, or five skeins of yarn and include jewelry, shawls, vests, cardigans, skirts, bags, scarves, accessories, toys, and even stuff for babies. The patterns are divided by sections depending on how much yarn they use. Also included are helpful tips from the different designers on how to save money while using your yarn stash more efficiently. Included Designers: Rebecca Velasquez, Margaret Hubert, Sheryl Means, Linda Permann, Robyn Chachula, Simona Merchant-Dest, Vashti Braha, Marlaina Bird, Carol Ventura, Tracie Barrett, Megan Granholm, Ellen Gormley, Julia Vaconsin, Kristin Ohmdahl, and Doris Chan.